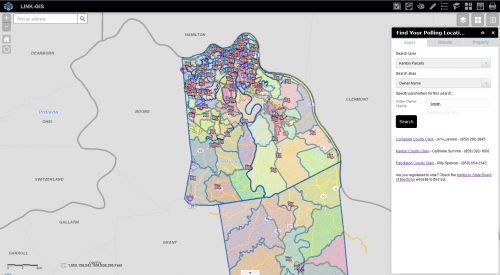 The Voting Information map shows the precincts and polling locations in Campbell, Kenton, and Pendleton Counties. This easy to use map allows the user to search polling locations by clicking on precincts on the map or search by precinct name in the Find Polling Location. There are two widgets available to find a polling location. By default, the “Find Your Polling Location” widget opens. This allows users to find their polling location by Name, Address or Parcel Identification Number. To use this widget, choose the county from the layer parcels option, to conduct the search on. Then choose what information to search, such as Owner Name, Address or Parcel ID Number. Then click the “Search” button. The features that match the search will show in the “Results” of the widget and be highlighted in yellow on the map. Click on one of the selected features in the “Results” to find the corresponding Poll and Precinct Information. The Poll and Precinct Information, along with other information will display in the “Property” window of the “Find Your Polling Location” widget. Minimize the widget by clicking the stacked arrows in the upper right hand corner of the widget. Close the widget by clicking the “X” in the upper right hand corner of the widget. The widget can be reopened by clicking the Check Mark icon in the toolbar. The second widget is called “Polling Location by Precinct” allows users to find a polling location by Precinct Name. To open the “Polling Location by Precinct” widget, click on the “vote” icon in the toolbar. 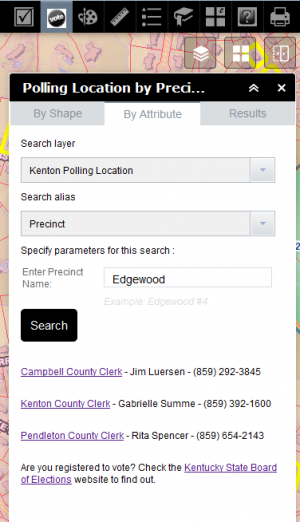 Select the county to search in, then type in all or part of the name of the desired voting precinct. The features that match the search will show in the “Results” of the widget and be highlighted in yellow on the map. Click on one of the selected features in the “Results” to zoom to the polling location on the map. Click on the image thumbnail to see a larger photo of the polling location.